Have you heard of the saying "Don't put all your eggs in one basket?” I have- a number of times actually. And if we are going to talk about budgeting, saving, and investing, I would tell you the same. I am quite knowledgeable on how I manage my earnings from my bonuses, talent fees or my regular salaries. But, it took me a while to make the first step to make my earnings work harder for me. I’ve invested in different financial products already but I’ve never encountered an investment plan that’s as easy and as user-friendly as Manulife’s GradMaker. GradMaker is a mobile app launched January this year which is designed for parents like us who may be too busy to meet investment counselors or financial advisors. Sometimes even if we have time, we feel awkward about discussing financial matters with someone else that is why GradMaker is a good companion for us. As parents we have one common dream- to give our children a better and more secure future. This is the reason why we work hard in what we do. We do our best to save up for our dream house so we can live more comfortably. We save up for our dream car so we can travel more easily. And most importantly, we save up for our children’s education so we can get a sense of security that they will be alright when they grow older. Saving can be tricky and one way to make it easier, simple, and fun is by investing in GradMaker. I attended the launch of GradMaker recently and Bianca Gonzalez-Intal, its brand ambassador said, "My husband and I were looking at tuition fees and it's sort of crazy how high they will be by the time our daughter enters university.... 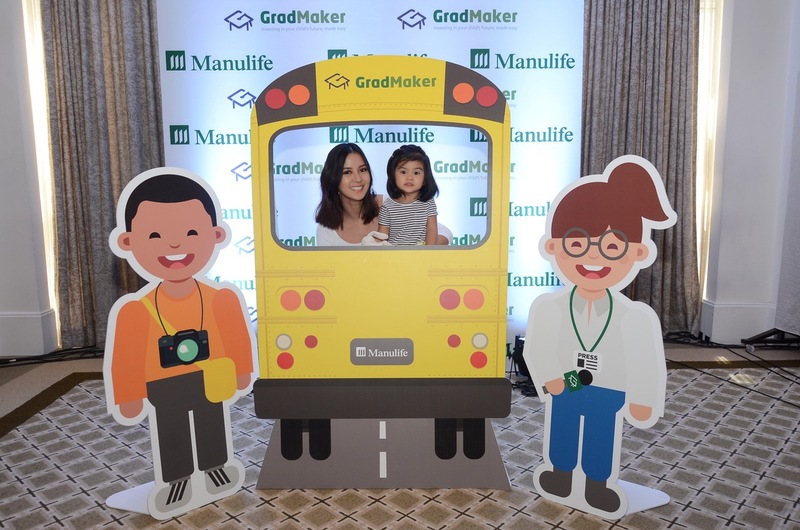 It made us want to start saving and investing right away, so I'm happy Manulife launched GradMaker. It give parents like us a convenient way to prepare for our children's college education." 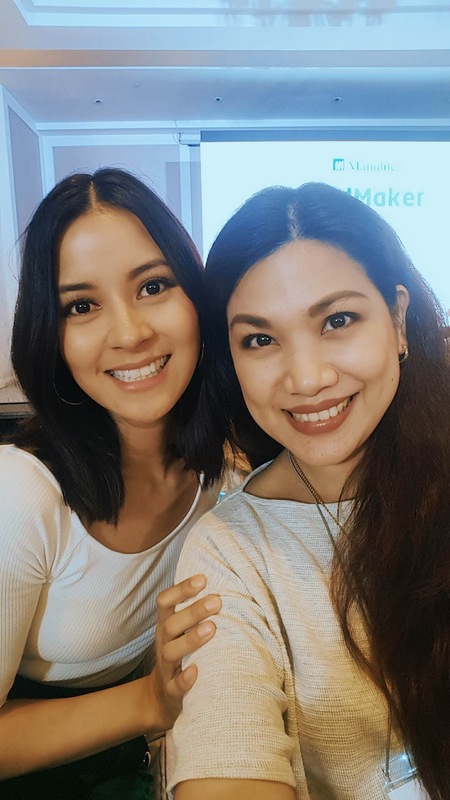 Bianca Gonzalez-Intal w/ daughter Lucia - WELCOME TO MANULIFE! Bianca Gonzalez-Intal and daughter Lucia are the newest brand ambassadors of Manulife Philippines. They talked about GradMaker, a mobile application that offers flexible and convenient investing, among select members of the media. 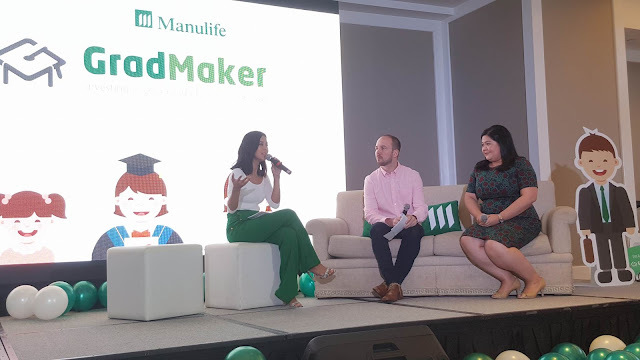 Bianca Gonzalez-Intal, Manulife's brand ambassador asks Ryan Charland, President & CEO of Manulife Philippines and Melissa Henson (rightmost), SVP & Chief Marketing Officer more about GradMaker. Manulife executives with Bianca Gonzalez-Intal w/ daughter Lucia - BE A GRADMAKER! 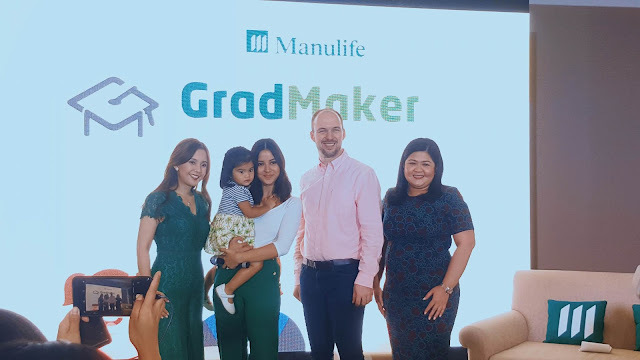 Ryan Charland, President & CEO of Manulife Philippines, joins new brand ambassadors Bianca Gonzalez-Intal and daughter Lucia during the launch of mobile app GradMaker. They are joined by Melissa Henson (rightmost), SVP & Chief Marketing Officer, and Bim Gutierrez (leftmost), SAVP & Chief Innovations Officer. When we think of investments, we think - "Naku, kailangan ng malaking pera o capital dyan." This is what bought me into GradMaker, for as low as Php10,000, you could already buy policies anytime and you are not bound to a monthly payment schedule! And because it's an investment app, you manage and pay with just a few clicks on your phone. You can also check the performance of your investment anytime you want without bothering a financial advisor. In less than 15 minutes, you could already sign up and make an investment so you could start saving for your children's education. The online policies may be paid using a credit card or a debit card. There's a Tuition Fee Calculator - which allows you to have a university or college tuition fee savings goal for your investment. It helps you visualize how much money you would need to save up for your children’s future. Your money will be invested in professionally managed funds for long-term growth. Policy owner is insured for at least 125% of the amount invested. GradMaker is a Variable Life Product. Everything is done online - you manage your investment yourself, from signing up, investing, monitoring your account, to withdrawing. YES! You can withdraw your investment anytime! Are these features great or great? I am definitely sold into Manulife's GradMaker. Going back to what I said earlier regarding putting your eggs in different baskets, I will put some in GradMaker and watch my money grow as I save up for my children's future. Parents, I am sure that you will appreciate the full digital investment experience. and Apple App Store for select Android and iOS devices. For more information about GradMaker, visit Manulife's GradMaker website.